Located in the quiteness of the Alps, Sacro Monte Calvario is a place of peace and spirituality that can offer precious and unique experiences. Here Blessed Antonio Rosmini founded the Institute of Charity on 20th February 1828. Things that contribute to make it a special place are the long Way of The Cross, with the artistic Chapels that reproduce in full size the scenes of the Passion of Jesus, the Shrine of the Holy Crucifix, various other little Churches and Chapels, the Convent of the Rosminian Comunity, the panoramic gardens of the Belvedere, the remains of the Medieval Castle of Mattarella. Since 2003 Sacro Monte Calvario is part of the UNESCO artistic and naturalistic sites considered patrimonies of the humanity. Located inside the area, the Convent of the Rosminian Fathers offers hospitality in rooms with toilette and shower facilities en-suite, where it’s possible to spend time in silence and peace (B&B, half or full board accommodation). · Meetings and conventions with the availability of a Meeting Hall (100 seats). · Hospitality up to 50 people in single, double and triple rooms. There’s also a covered parking area with 50 parking spaces. For families, schools, parish groups and other similar situations it’s possible to arrange suitable solutions according to the specific needs. Many are during the year the events that take place at Sacro Monte Calvario, such as exhibitions, conventions, concerts. First of all a place for silence and recollection, for prayer and for time to spend with God. Than a site of considerable interest for the artistic and naturalistic beauties, for monumental structure of the Holy Calvary and of the Castle, for the impressive gardens, the various tracking paths in the nearby area and in the various nearby valleys, and for the richness of living historic and folkloristic traditions. 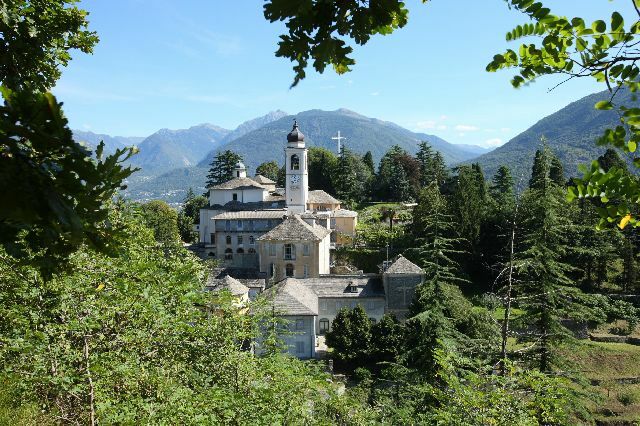 You can walk to Calvario from the Railway Station of Domodossola following directions given by the posts along the City Streets. You can come by train, coming from Italy, taking trains from Milan (Centrale or Garibaldi Railway Stations) or from Novara. You can come by train, coming from Switzerland, taking trains from Briga (Sempione) or by the “Vigezzina” Railway (that starts its trips from Locarno). You can come by car, from Milan, trough highway A8 and A26. You can come by car, from Genoa, trough highway A26. In both cases, continue along the Sempione Motorway till you reach the exit Domodossola. Then follow street indications. You can finally come by plane, taking flights to Malpensa-Milan Airport (and then come directly to Domodossola with a specific shuttle) or to Orio al Serio-Bergamo (taking a bus to Milan and then from there a train to Domodossola).